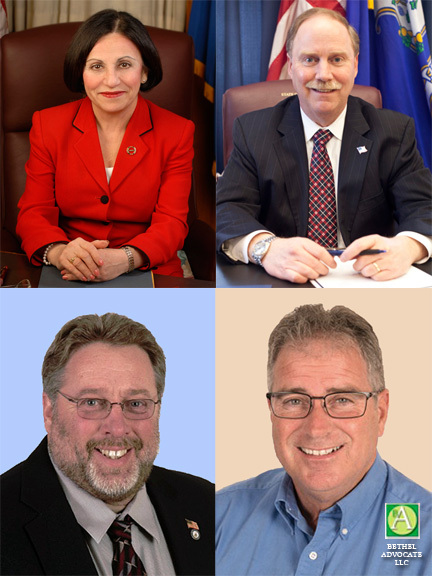 BRTC Lincoln Reagan Dinner Honorees: Toni Boucher (upper left) and Michael McLachlan (upper right) Republicans of the Year; First Selectman Candidate Steve Deuschle (lower left) The John L. Thiele Distinguished Service Award; andJay Streaman (lower right)The Denis J. Riordan Award. The Bethel Republican Town Committee invites you to attend their annual Lincoln Reagan Dinner, honoring Toni Boucher and Michael McLachlan as Republicans of the Year. Steve Deuschle will receive the John L. Thiele Distinguished Service Award. Jay Streaman will receive the Denis J. Riordan Award. Pre-reservation by April 6th is $60 per person / $100 per couple. After April 6th is $65.00 per person / $110.00 per couple. There will be a Cash bar and dinner starts at 7:15. Please visit http://www.bethelrepublicans.com/lincoln-reagan-dinner/for more details and to reserve your spot.